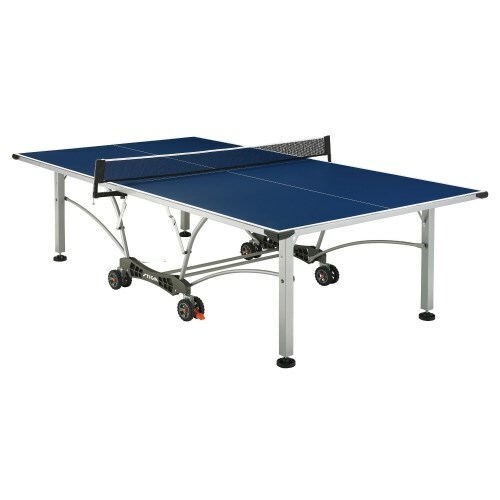 Enjoy a game of table tennis outdoors with the Baja T8562 game table from Stiga. This table features a quick-play chassis that allows for easy setup and nearly immediate play. Includes a factory warranty from the manufacturer, Escalade Sports. Outdoor Table with Exceptional Durability and Playability. Perfect For a Deck, Garage, or Covered Porch. Quickplay Chassis for Quick and Easy Assembly. Aluminum Composite Top Won't Warp or Rust. Heavy-duty welded steel support frame. Oversized composite caster beam with steel cross beam supports. Molded corner protectors protect from snags. Translucent graphic on aluminum underside of tops. Table Weight: about 200 lbs. 2 inch Self-Opening Steel Legs with Leg Levelers. 5" All-Terrain, Double Wheels with Locks. 72" Pivoting, All-Weather Net and Post Included. Q: I have this table and am needing to replace the wheel assembly for both sides. where can I get these? A: Yes, you can get that part by calling 800-467-1421. Feel free to contact us with any other questions. A: For those replacement parts please call 1-800-467-1421. A: The warranty is through the manufacturer, Escalade Sports. This product ships from the warehouse in San Diego, California via an ltl carrier for a curbside delivery. This type of delivery requires the customer to be present to sign for the shipment and to move the product wherever needed on the delivery property. The driver will not assist with moving the product onto the property. Delivery appointments are scheduled through the freight company before delivery is attempted. You can either wait for the freight company to contact you to schedule the delivery appointment, or you can contact the freight company directly to schedule the appointment once you have the tracking information for the shipment. Dimensions: 60" x 45" x 12"